On December 2, Congressman David G. Valadao (CA-21) introduced controversial water legislation in the U.S. House of Representatives purported to provide “short- term relief” from California’s water crisis. “I will not let this year end without exhausting every possible option to bring relief to the Central Valley,” Valadao vowed. In response, Barbara Boxer late on Wednesday released a statement that "this measure could reignite the water wars by overriding critical state and federal protections for California," all but ensuring that the bill will be die until the Republican-dominated Senate and House take over next year. 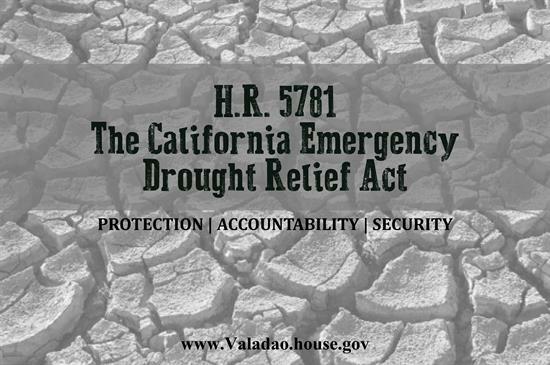 There is no doubt that Valadao and his fellow San Joaquin Valley Congressmen will make the passage of this legislation a priority in 2015. Original cosponsors of the legislation include Reps. David G. Valadao (CA-21), Kevin McCarthy (CA-23), Ken Calvert (CA-42), Jim Costa (CA-16), Doug LaMalfa (CA-01), Tom McClintock (CA-04), and Devin Nunes (CA-22). Environmental groups took strong issue with Valadao’s claim that the “legislation contains no controversial measures for either party,” pointing out that it would eviscerate Endangered Species Act protections, overrule the Delta smelt biological opinions and increase pumping from the Delta. This would take place at a critical time when fisheries desperately need water flows to recover from the drought. The group also said the bill provides for a 30-day federal review of all projects and operations that “would provide additional water supplies.” This could ultimately result in the fast-track approval of ruinously expensive, environmentally destructive and ultimately inefficient schemes, including new dams. “This bill will actually perpetuate our drought emergency by giving away all the water in storage to Big Ag,” said Tom Stokely, water policy analyst for the California Water Impact Network. “It will drain Trinity Lake, depleting the last cold water reserve available for Klamath and Trinity River salmon and steelhead. We’ll see fish kills that make the great die-off of 2002 look minor by comparison." “No matter how you cut it, this bill is an utter disaster. We’re calling on Dianne Feinstein and Barbara Boxer to oppose this legislation in the Senate. They need to step up and protect California’s water supplies, urban ratepayers, environment, family farms and fisheries,” Stokely concluded. Restore the Delta (RTD), opponents of Governor Jerry Brown’s Bay Delta Conservation Plan (BDCP) to build the salmon-killing peripheral tunnels, criticized Representative David Valadao for trying to push through a “drought relief” measure that would allow more water for Westlands’ and Kern Water Districts’ mega-growers in the midst of a severe drought. “Congressman Valadao’s bill is more of the same from this Congress that is bent on circumventing state water rights and stopping state and federal agencies from determining and implementing safe water export levels for San Francisco Bay-Delta fisheries, Delta farms, and Delta communities,” said Barbara Barrigan-Parrilla, executive director of Restore the Delta. “The sponsors of this legislation favor big industrial growers who have planted tens of thousands of acres of almonds and other permanent crops in the midst of the drought, and those who seek to profit from selling water to the detriment of Northern California rivers, groundwater supplies, and the Bay-Delta estuary,” added Barrigan-Parrilla. “Members of Congress are manipulating the impacts of drought conditions to serve wealthy special interests. They’re framing the bill as non-controversial, and bipartisan, but it would smother Endangered Species Act protections, overrule the Delta smelt biological opinions, and increase pumping from the Delta, when fisheries need flows presently to recover from the drought,” she stated. “These same Congressional Representatives never consider what will be the economic impacts on the Bay-Delta economy as water quality and fisheries continue to deteriorate from decades of over pumping the Delta. They continue to exclude the 4 million residents of the Delta region, even though their economic and environmental well-being is tied to the health of the region. We are tired of their ongoing political assault on our communities,” concluded Barrigan-Parrilla. “With just a few days left in the legislative session, the House plans to pass yet another divisive, dishonest, and potentially devastating California water bill without any public input or legislative oversight. This is unconscionable, and just the latest chapter in Republicans’ reckless approach to micromanaging the state’s water during one of the worst droughts in our history. “The idea that this bill is a ‘compromise’ is laughable. It is clear that this bill was thrown together without any input from anyone other than those who stand to benefit from its passage. This bill was not reviewed by the Natural Resources Committee, nor has it received input from federal agencies, the state, affected local water agencies, the fishing industry, tribes, or communities. Legislation this sweeping should be the subject of public hearings and input from all affected stakeholders. “The bill makes it more difficult for state and federal agencies to make real-time water decisions, undermines state water rights priorities, misstates current law, and explicitly overrides the Endangered Species Act. These sweeping changes would place the west coast’s environment, tribes, communities, and the fishing industry in harm’s way in the next drought year.